The What's New page is used to show a list of assets that have been created, updated or published between either a specified date range or rolling time period. For example, you can enter a date range (for example, between the 1st January 2010 and 17th January 2010) to show all asset results from between the specified dates. You can also appoint a time period, such as the current day or week or a period relative to the current date (3 days in the past) to create a "rolling" What's New page. The What's New page is an extension on the Asset Listing page. All of the functionality that is available on the Asset Listing page is also available on the What's New page. This chapter will only cover the additional features of the What's New page. Once your What's New page is created, you can configure its settings on its associated asset screens. The majority of these screens are the same or similar to those for a Standard Page and an Asset Listing Page and are described in either this manual or the Asset Screens manual. In this chapter we will describe the Details and Date Ranges screens, which are different for a What's New page. The Details screen allows you to configure various settings including what types of asset to list, where to find the assets to list and the date range to use. The Details screen of the What's New page is similar to the Details screen for an Asset Listing page with the only difference being the Date Range Settings section, which is outlined in the section below. For more information on any other sections and fields, refer to the Details Screen chapter in this manual. This section allows you to set the date range and time periods to use for the What's New page. Created Date: this is the date that the asset was created. Last Updated Date: this is the last time the Commit button was pressed on the asset. Last Published Date: this is the last time the Status of the asset was changed to Live. Specified Range: this option allows you to specify a date range for the What's New page using the Date Range From and Date Range To fields. By default, this option is selected in the Range Type field. Today: this option will set the What's New page to display results for the current day. If this option is set, any information entered into the Date Range From and Date Range To fields will be ignored. This Week: this option will set the What's New page to display results for the current week (starting on Monday). If this option is set, any information entered into the Date Range From and Date Range To fields will be ignored. This Month: this option will set the What's New page to display results for the current month. If this option is set, any information entered into the Date Range From and Date Range To fields will be ignored. This Year: this option will set the What's New page to display results for the current year. If this option is set, any information entered into the Date Range From and Date Range To fields will be ignored. 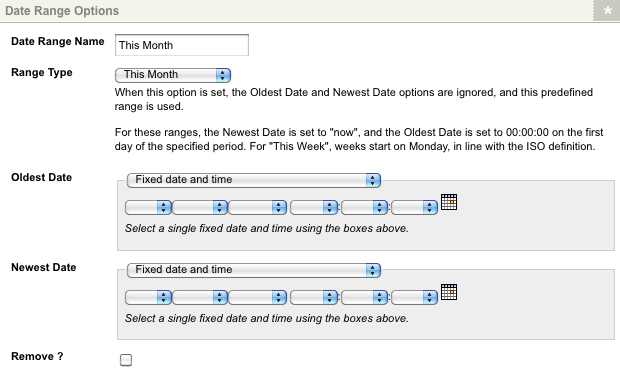 Fixed date and time: this option allows you to enter a fixed starting date and time for the Date Range. Use the fields available to enter the starting date for the Date Range, for example, 1 Apr 2010 1:30:00 will set the start date to the 1st of April 2010 at 1:30 am. A calendar is available to assist you when selecting the date. Period relative to the current date and time: this option allows you to set the starting date of the Date Range as a time period relative to the current date and time. Use the fields available to enter the starting date for the Date Range. You can select any number of minutes, hours, days, weeks, months or years in the past or future. For example, 10 hours in the future will set the start date to ten hours from the current time. Period relative to a fixed time on the current date: this option allows you to set the start date of the Date Range to a fixed time on a time period relative to the current date. Use the fields available to enter the starting date for the Date Range. You can specify a time on any selected number of days, weeks, months or years before or after the current day. For example, 2 days before the current day at 17:00:00 will set the start date to2 days ago from today, at 5:00 pm. Fixed date and time: this option allows you to enter a fixed ending date and time for the Date Range. Use the fields available to enter the ending date for the Date Range, for example, 17 Apr 2010 18:00:00 will set the end date to the 17th of April 2010 at 6:00 pm.calendar is available to assist you when selecting the date. Period relative to the current date and time: this option allows you to set the ending date of the Date Range as a time period relative to the current date and time. Use the fields available to enter the ending date for the Date Range. You can select any number of minutes, hours, days, weeks, months or years in the past or future. For example, 15 days in the past will set the end date to fifteen days ago from today. Period relative to a fixed time on the current date: this option allows you to set the ending date of the Date Range to a fixed time on a time period relative to the current date. Use the fields available to enter the ending date for the Date Range. You can specify a time on any selected number of days, weeks, months or years before or after the current day. For example, 1 week after the current day at 12:00:00 will set the end date to 1 week from today, at midday. The Date Ranges screen allows you to set up a list of date ranges. The user can then select which date range they want to view on the What's New page. For example, you can create a list where the user can select to view the assets that were created in today, this week, this month or this year. By default, no date ranges will be added to the list, as shown in the figure below. To add a new date range, click the Add New Range box and click Commit. Additional fields will appear in the Date Range Options section, as shown in the figure below. 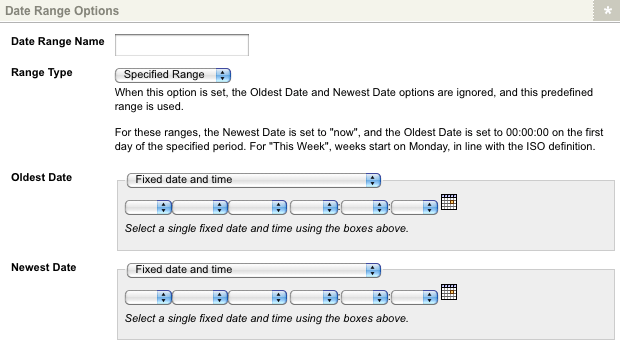 Set up the following fields for the new date range. Date Range Name: enter a name for the new date range, for example This Month. This will appear in the list to the user. Range Type: select whether to use a specified or set date range. The options available in this field are similar to those in the Range Type field on the Details screen. For more information, refer to the Details screen section of this chapter. Oldest Date: this field allows you to enter the starting date of the date range. The options available in this field are similar to those in the Date Range From field on the Details screen. For more information, refer to the Details screen section of this chapter. Newest Date: this field allows you to enter the ending date of the date range. The options available in this field are similar to those in the Date Range To field on the Details screen. For more information, refer to the Details screen section of this chapter. Once you have filled out these fields, click Commit. The date range will be added to the Customise Range list in the Current Date Ranges section, as shown in the figure below. You can add as many dates ranges as you want to the list. To edit a date range that you have added to the list, select it from the Customise Range list in the Current Date Ranges section of the screen. The fields for that date range will appear in the Date Range Options section, as shown in the figure below. Edit the date range using the fields provided and click Commit. To delete a date range that you have added to the list, select it from the Customise Range list in the Current Date Ranges section of the screen. The fields for that date range will appear in the Date Range Options section. Click the Remove box within this section and click Commit. The date range will be removed from the list. Date Range List: this will show the list of date ranges in the drop down list. When a user selects a value from the list, the What's New page will be updated to show the assets for that date range. Date Range List Linked: this will show each date range as a hyperlink. When a user clicks on the hyperlink, the What's New page will be updated to show the assets for that date range. To understand how to set up a What's New page, consider the following example. We want to create a What's New page for our Site called Latest Pages. It should show the pages that have been published in the last 5 days. To set up this What's New page, follow the steps outlined below. Create a What's New page called Latest Pages under your Site. Date Field: select Last Published Date. Range Type: select Specified Range. Date Range From: select Period Relative to the Current Date and Time and enter 5 days in the past. Date Range To: select Period Relative to the Current Date and Time and enter 0 days in the past. Asset Types to List: select Pages and click inherit. Root Nodes: select the Site. Right click on the Page Contents Bodycopy in the Asset Map and select Edit Contents. Format what to show for the page. An example of what you can do is shown in the figure below. Right click on the Default Format Bodycopy in the Asset Map and select Edit Contents. Format what to show for each asset in the list. An example of what you can do is shown in the figure below. When you preview the Latest Pages page, the assets that have been published will appear, as shown in the figure below.